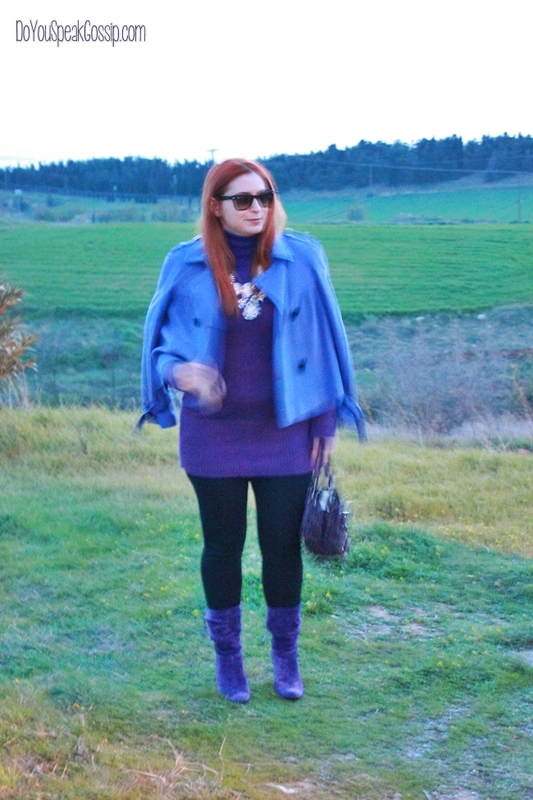 Purple sunsets | Outfit post - Do You Speak Gossip?Do You Speak Gossip? I wore this casual outfit on Sunday to go out with T. but we were running late, so we just caught the last of sun to take these photos. Some of them are a bit blurry but we did our best. The light was so little because of the clouds, that it was impossible to take photos without flash or a tripod. In the last ones we finally gave up and used flash to show you some details. And I’m posting them knowing that some people will ask me again why do I wear sunglasses when it’s dark outside (by the way, it wasn’t), but oh well, my dear frequent readers, you know the answer to that. I hope you enjoy it despite the quality of the photos. Φόρεσα αυτό το αρκετά χαλαρό σύνολο την Κυριακή για να βγω με τον Τ. αλλά επειδή αργήσαμε να συναντηθούμε, με το ζόρι προλάβαμε το φως του ήλιου. Μερικές είναι κάπως κουνημένες, αλλά κάναμε ότι καλύτερο μπορούσαμε. Το φως ήταν τόσο λίγο και λόγω της ώρας, αλλά και της συννεφιάς που υπήρχε, που ήταν αδύνατο να βγάλουμε φωτογραφίες χωρίς φλας ή τρίποδο. Στις τελευταίες παραιτηθήκαμε και χρησιμοποιήσαμε φλας για να σας δείξουμε κάποιες λεπτομέρειες. Τις ανεβάζω γνωρίζοντας ότι αρκετοί θα με ρωτήσουν πάλι, γιατί φοράω γυαλιά ηλίου ενώ έχει σκοτάδι (παρεμπιπτόντως δεν είχε ακόμα), αλλά τι να κάνουμε, οι αγαπητοί μου αναγνώστες που με επισκέπτονται συχνά ξέρουν ήδη την απάντηση. Ελπίζω να τις απολαύσετε παρά την ποιότητά τους. Υπέροχο το χρώμα αυτό και σου πάει πάρα πολύ κοπέλα μου!Μου άρεσαν απίστευτα οι μποτούλες σου. Όντως, σου ταιριάζει πολύ το χρώμα αυτό!!! Και όλο το outfit είναι πολύ-πολύ όμορφο!!! The necklace! I fell in love with it, makes a great statement, those boots are wowsers! Never mind the flash, they came out just fine! Thank you for saying that. I was afraid they won’t look good, because flash is generally something you avoid using for these photos. The necklace is Zara from the AW 2012 collection. A nice statement piece, but a bit expensive for high street. Luckily my cousin bought it for me as a gift. I love your outfits, ALWAYS, and it was not different now – but I’ll pick my favorite pieces 🙂 the boots (of cooooourse! ), the jacket and the fabulous necklace! You look amazing and your elegance is shown all through each picture! Such a great style! Makia! I was crazy about these boots when I bought them some years ago, and to think they were a bit high for me then, and now I could wear them all day. I find them really casual but T. found them more dressy due to their color. Thank you very much. You always make my day with your comments, really! Just to tell you that everything I write about you is soooo true – you are more than a beautiful girl – you are gorgeous and extremely sweet! You’re the one who’s extremely sweet! Thank you very much! I hope you have an amazing long weekend. Happy Easter! S’euxaristw poli gia ta kala sou logia Marina! Den exw GFC giati den eimai ston Blogger, exw omws Blologin’, FB kai Twitter an thes na me akolouthiseis se kapoio ap’auta…Tha to ektimousa vathitata! Tha perasw poli sintoma apo to blog sou!